I’ve been doing my best not to let my insecurities get the better of me. Some days I still do nothing but hurt, but it’s getting easier to accept myself during those low points. I’m fortunate to have friends who forgive me when I’ve been out of touch and out of time, even if they don’t understand why. Deleting my Facebook account was the biggest step I’ve taken towards avoiding unhealthy media; one of those things people say they want to do, but can’t, cause it’s their only connection to some community or circle of friends. I decided the habit is too detrimental to my well-being, even if the same is true for me. Pat and I have been playing EDH on top of our drafts, something that frequently involves him forgoing homework while I give up time to myself. The complex card interactions and unpredictability of the singleton format make playing a deck as much fun as building it. 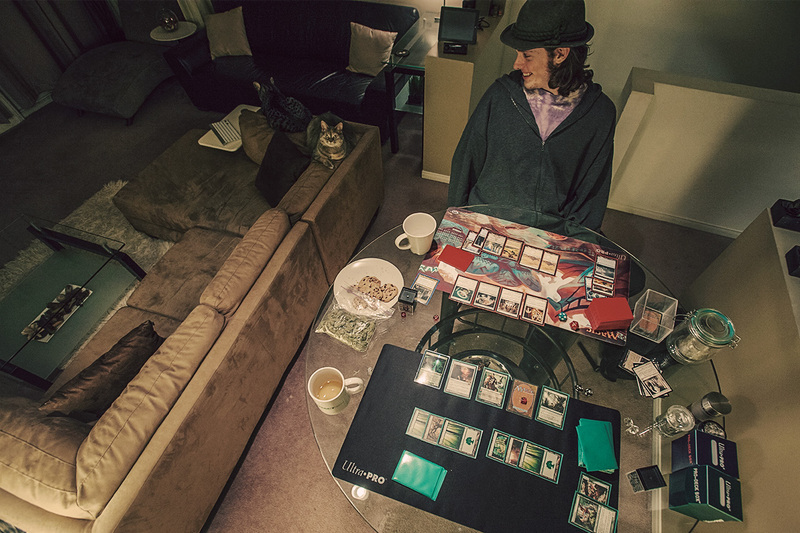 I’ve been running the Modern tournament he competes in every week, and afterwards, we head back to the warmth of the house and the company of the cats. Freezing rain becomes a reason to stay up late and crash and play more in the morning. It makes me feel like I’m in university again, full of boyish vigour, young enough to have the freedom to act so irresponsibly, while old enough to know better. In moments between battle, I learn we’re all recycled stardust, that it’s possible for parents to accept their children despite their problems, and smoking gunpowder hash will serve for sleep. Every now and then, Heather G stops by to leave me a small package of things like premium loose leaf tea, dark chocolate, and organic fruit; small treasures on which a shared life can be centred, and reminders that I’m never forgotten. In doing so, she’s become one of the people who provides me with the consistent reassurance I need, even though entire seasons may pass before we have a chance to connect. Her love and generosity carries me through the times we’re too busy doing the things we need to survive.